Mobile data synchronization is becoming increasingly important for many people, and various standards have arisen to perform this two-way copying ‘over-the-air’. The most important platforms that can do wireless synchronisation are ActiveSync that is used to communicate with Exchange Server and Research-in-Motion’s BlackBerry Enterprise Server (BES). Both solutions require proprietary server-side software from the vendor, therefore limiting the use of PIMs (personal information managers) to either wired synchronization or irritating 3rd-party synchronizers requiring the installation of client software on the PDA. This is where Open source Z-Push comes in; it is an implementation of Microsoft’s ActiveSync protocol which is used ‘over-the-air’ for multi platform ActiveSync capable devices, including Windows Phone, Apple iPhone and iPad, Android and Blackberry 10 devices. Open source Z-Push enables any PHP-based groupware package to become fully syncable with any ActiveSync-compliant device. Being an opensource project under the AGPL v3, it allows developers to add their own backend so that Z-Push can communicate with their groupware solution. Currently, Z-Push is available with the following backends: the IMAP and the maildir backends for e-mail synchronisation, the vCard and CardDAV backends for contact synchronisation, CalDAV backend for calendar and task synchronisation and one for the Kopano package which allows full synchronisation of E-mail, Calendar, Contacts and Tasks. There are also a SQL backend to save the states in a database and searchLDAP backend for Global Address List search. We expect that other backends arise in the near future as the opensource community gets the grips with the new possibilities. 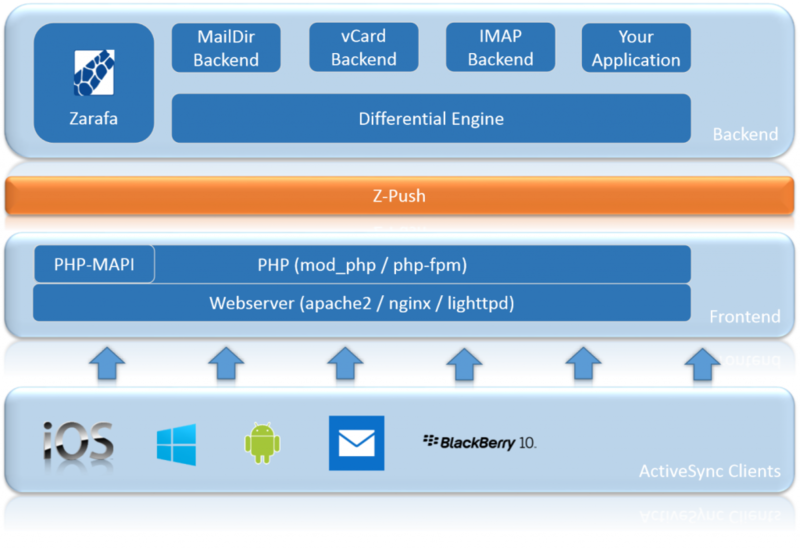 Z-Push was developed and tested with the Apache2 Webserver and PHP. There are also known implementations running with nginx, lighttpd. Z-Push was initially developed by Zarafa Deutschland GmbH (Germany).